Yep, it’s Wily again – no tricks or ruses this time, just 18 classic Robot Masters rebuilt to cause chaos all over again. 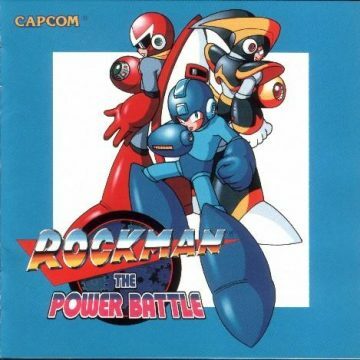 Made for the arcades originally, The Power Battle is a series of boss battles against old bots from Mega Man 1 through 7. 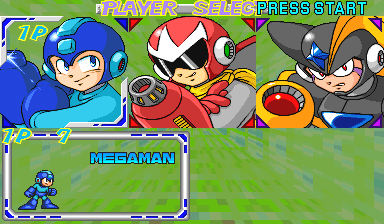 As a nice change of pace, the game offers 2-player simultaneous play with Mega Man, Proto Man, and Bass selectable, though there isn’t much significant difference between them. There are three modes of play, which determine the Robot Masters to fight: Mega Man 1-3, Mega Man 4-6, and one exclusively using Mega Man 7 bosses. 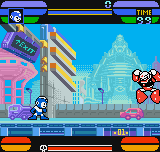 Each mode has six stages, using the same set but with different palettes to signify different times of day, and the selection icon travels around the menu screen until you choose your stage. 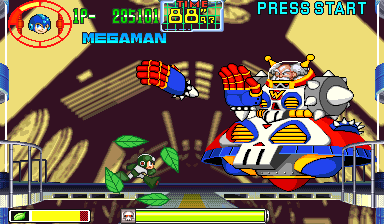 Defeating all six Robot Masters takes the heroes to Wily’s Flying Fortress for one last penultimate boss battle before taking on the madman himself. Being that this is an arcade game, the graphics and sound underwent a sizable boost. 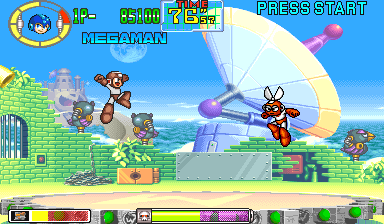 The player character sprites look a lot like Mega Man 7, but with added animation frames. 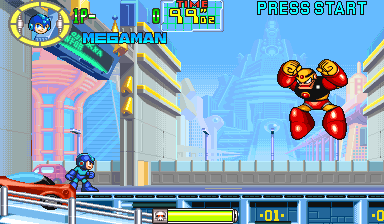 The returning Robot Masters have never looked better, given smooth motion and bigger sprites. 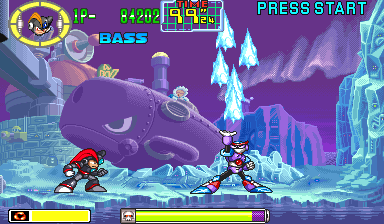 Even the bosses from Mega Man 7, while looking mostly in line with their SNES counterparts, are tweaked to look more impressive – especially Freeze Man. All the stage backgrounds are up to par with other anime-esque Capcom arcade titles at the time, like Darkstalkers or Street Fighter Alpha. 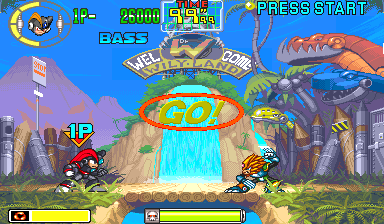 Almost all the music are returning stage and boss themes rearranged for the arcade chipsets, with many finding their way into later collections. The showstopper has to be the return of the Yellow Devil, given plenty of new attacks to showcase its morphing abilities that the consoles couldn’t quite convey. The Mega Man 7 route instead leads to the pumpkin miniboss from Shade Man’s stage. The biggest problem to bring this game (and its sequel) down is its simplistic nature. 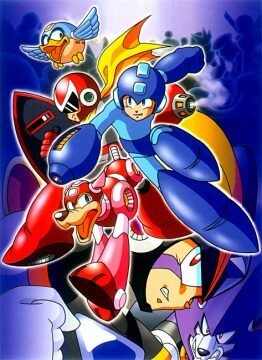 There’s none of the platforming challenge the series is known for, nor any enemies to fight outside of the bosses themselves. Each boss adds nothing more than a longer health bar, and they all try to whittle the player’s health down with the same attack patterns. Once the correct fighting order has been figured out, the game becomes rather easy to clear with one or two credits. 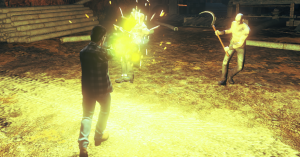 The endings for the characters are rather bland, save for Bass’, which sets up his stance towards his creator, but doesn’t pay off until the sequel. The game was built for the CPS II arcade system, but was also ported down to the CPS I for older arcade cabinets. The only major change is the lack of QSound in the CPS I builds. The title got a limited release stateside, but only for the CPS I. An international CPS II model was planned but scrapped. The North American version also changed a few menu backgrounds for score ranking and weapon obtaining, along with the removal of most of the Japanese voices. The game also holds unused enemies that would’ve popped in during the boss battles as well as assisting animal helpers. Both of these exclusions would return for the sequel.